Audi’s planned all-electric compact SUV based on MEB will be presented on 5 March at the Geneva Motor Show as a near-series study. The still nameless Audi BEV will roll off the production line starting in 2021, as will the VW ID. and a compact electric car from Seat at the Zwickau plant. 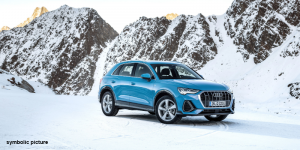 During the announcement by a company spokesperson, it was also said that Audi will also be presenting four plug-in hybrids in Geneva, all of which will go on sale this year, including a PHEV version of the Q5 SUV model. But going back to the future compact SUV: It is to be positioned as a premium electric car in the compact segment – “i.e. it will roughly take on the role of the somewhat finer and more expensive brother who is playing the Audi A3 compared to the VW Golf at the moment,” as Automobilwoche reminds us. The VW counterpart to the Audi BEV will be the Golf-size ID., which the Wolfsburg company plans to launch in 2020. Rumour has it that the later trade name will be ID. Neo in circulation.